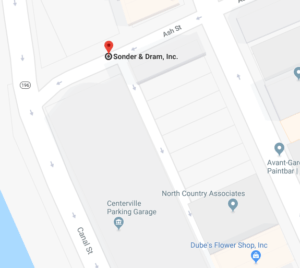 Parking is easy and all around Sonder & Dram! Across the street The Centerville Parking Garage offers free parking on weekdays from 6pm – 6am and all weekend. There is also plenty of on-street parking just steps from our door on Ash, Lisbon, and Canal Streets. Copyright © Sonder & Dram, Inc.